From clues inside, I found that this keepsake belonged to Ida A. (Myers) Bonney of New London, Ohio. 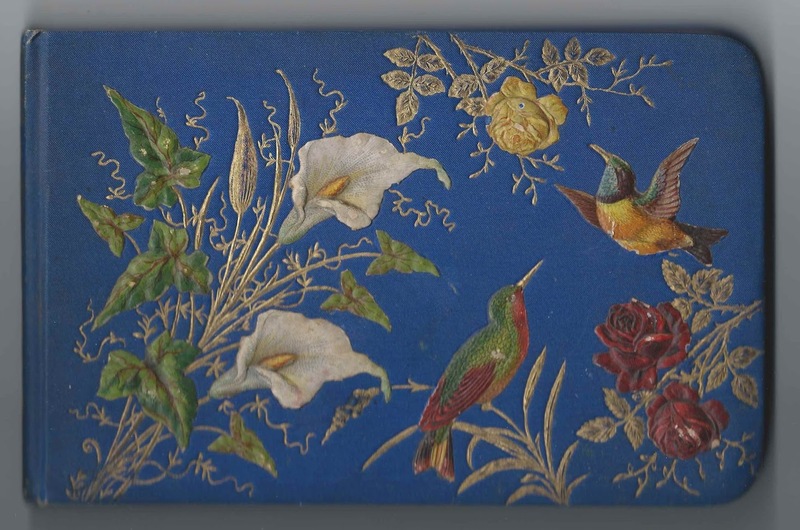 The album measures approximately 7-3/4" x 5" and contains the sentiments of five of Ida's relatives and in-laws. An alphabetical surname list and an alphabetical list of the signers, together with any personal information they may have offered, appear at the end of this post. Cousin Fan signed a page in Ida's album on July 31, 1882. I haven't found her identity. 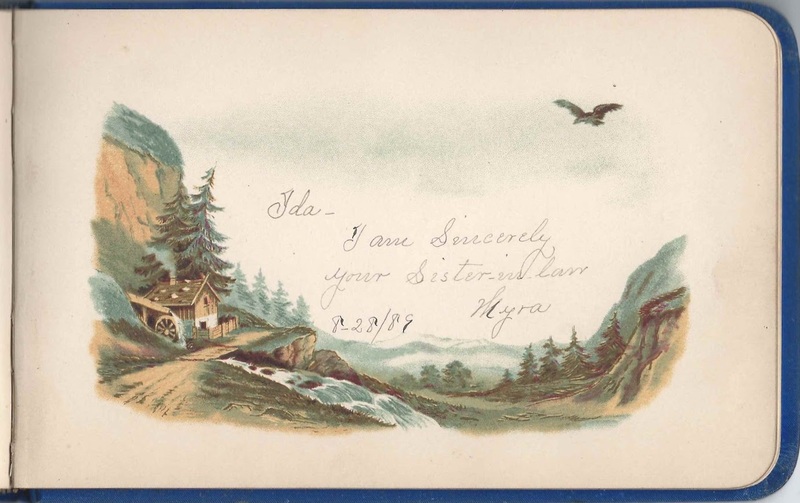 Myra signed a page on August 28, 1889 and called herself Ida's sister-in-law, one of the clues to Ida's identity. The other clues were the pages signed by S. Bonney and Lafayette Bonney. Lafayette Bonney was married to Sarah (Stevens) Bonney; two of their children were Myra Bonney and Elvin Leon Bonney, who just happened to have married an Ida A. Myers. Sarah (Stevens) Bonney signed a page at New London, Ohio, on August 28, 1889. Lafayette of New London, Ohio, didn't date his page. Ida A. Myers was born about December 1859, the daughter of Emmanuel C. and Mary E. (Lamb) Myers, who were born in Pennsylvania and Michigan, respectively. On 20 September 1881 in Huron County, Ohio, Ida married Elvin Leon Bonney, son of Lafayette and Sarah (Stevens) Bonney. Elvin was born 9 November 1854. He and Ida moved to Ramsey, Illinois, where Elvin worked as a druggist; they had at least two children. If you have corrections and/or additions to the information above, or believe that Ida was a different person, please leave a comment. Likewise, please leave a comment if you have information on any of the signers listed below. S. Bonney, signed at New London, Ohio, on August 28, 1889. Presumably Sarah (Stevens) Bonney, wife of signer Lafayette Bonney and mother of signer Myra. Lafayette Bonney of New London, Ohio, signed on August 28, 1889. His wife Sarah (Stevens) Bonney and daughter Myra Bonney signed other pages.